With the cost of utilities increasing year on year can your business continue to keep wasting energy? With poorly insulated heating systems and hot processes losing heat from the surfaces of equipment, pipework, valves, heat exchangers and from open tanks which will be causing your business to consume more energy than required plus additional maintenance costs. 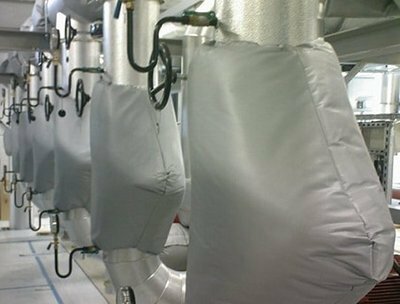 SMARTech energy has a SMART solution – SMART thermal insulation jackets, mats and pipework lagging, you can cut heat loss by as much as 90% and protect staff from burns and scalds. SMARTech energy can measure, specify and supply the required insulated SMART thermal insulation jackets and lagging for all sizes of pipework, valves, vessels, ducting systems, and storage tanks so that your own maintenance staff can fit them or we can offer a turnkey solution to include installation. Either way by implementing thermal insulation jackets and lagging to your heating systems and equipment, will enable a higher efficiency of heat to be supplied to the correct zones of building or equipment and reduce your energy consumption & carbon emission by as much as 10% of your total energy consumption. These solutions are low cost and deliver quick paybacks and you will notice that they are efficient and effective for prolonging the life of your pipe work, valves, flanges and boilers saving you money on repairs and maintenance. To find out more and understand how much energy SMART thermal insulated jackets & pipe lagging can save your business contact us today.